TVs have come a long way since their inception decades ago. Long gone are the days when families huddled around a giant unsightly box. Modern TVs are sleek and slim and LG’s new OLED TVs are amongst the thinnest you can get your hands on right now. In fact, not only does LG already have years of experience in manufacturing TVs, it was also one of the first companies to introduce OLED technology to the TV market. With rich experience in understanding the needs of the consumer, the LG OLED TV AI ThinQ is their latest flagship entry in the market in 2018. Here’s a quick look at some of the key features that they offer. AI ThinQ is the LG OLED TV’s natural language processing technology and opens up a whole new way of interacting with your TV. Instead of trying to find a particular task after browsing through multiple menus, the TV now lets you issue simple voice commands to access them directly. The TV is able to listen, think and then answer a multitude of requests and commands. Besides voice commands, users will also be able to enjoy faster internet searching thanks to voice. Further, the system also works without internet connectivity via 800+ offline voice commands. How does the TV do so much? 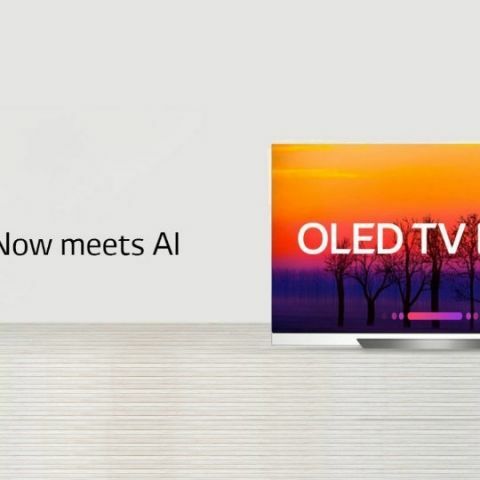 Well, the α9 (Alpha 9) Intelligent Processor is the brains behind the LG OLED TV AI ThinQ. Specifically designed for the TV, the processor does its bit in improving picture quality. The TV features Quad-Step Noise Reduction, which LG claims can significantly reduces noise by doubling the amount of noise reduction steps. The processor also offers other features such as a Frequency based Sharpness Enhancer, which the company says is able to boost fine detail and texture by accentuating the edges of an object in a picture. 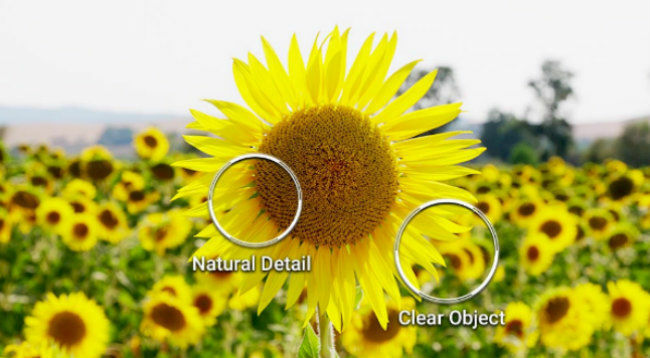 There is also an Object Depth Enhancer, which LG claims to be able to precisely separate the main object from the background images and analyzes textures and edges. This is then processed differently to make detection clearer and those edges sharper. The LG OLED TV AI ThinQ also comes with Dolby Atmos that aims to offer 360 degree surround sound without the need to get a separate sound system. A win-win situation for you as you watch your favourite TV shows and movies on the big screen. The technology aims to envelope the user with sound, thereby offering a 360 degree surround sound experience. It also supports Object Based Surround Sound for an even more immersive experience. Not only does the LG OLED TV AI ThinQ offer a 4K resolution, but also supports most HDR formats. This not only includes HDR10Pro and HLG Pro, but also Dolby Vision. What does this mean for you, the end consumer? HDR lets you enjoy better visuals with truer to life colours. These TVs area also used by Technicolour as consumer reference devices. As a result, buyers get to enjoy a more premium movie watching experience. This particular feature is sure to interest those who love to binge-watch their favourite movies and TV shows on Netflix. The LG OLED TV AI ThinQ has been tested by the folks over at Netflix and they have found the TV to be up to their standards of what a TV should offer. This includes features like a key on the remote for directly launching Netflix, as well as quick access of the TV menu. Further, the TV should be able to remember where the view left off the last time they were watching and continue watching from there.It should also offer the latest version of Netflix with all the latest features. Mobile Connection Overlay is a feature that is exclusive to LG TVs. 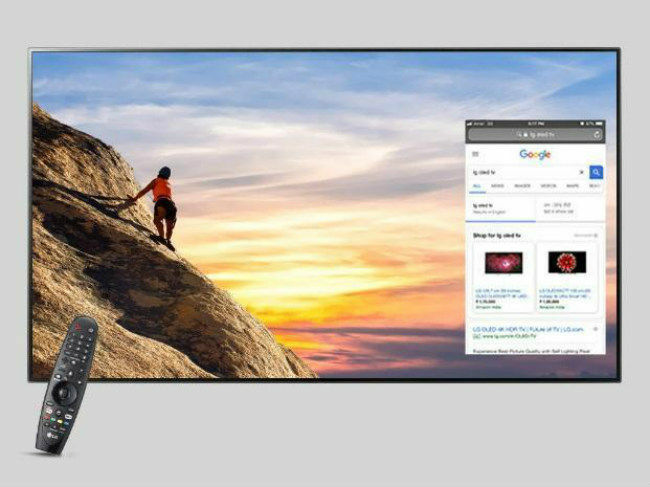 This lets users overlay their mobile screen on the TV at the same time as their regular TV content. In other words, the TV is able to support two inputs at the same time. So users are free to browse online or watch photos, without missing any part of the movie or TV show. 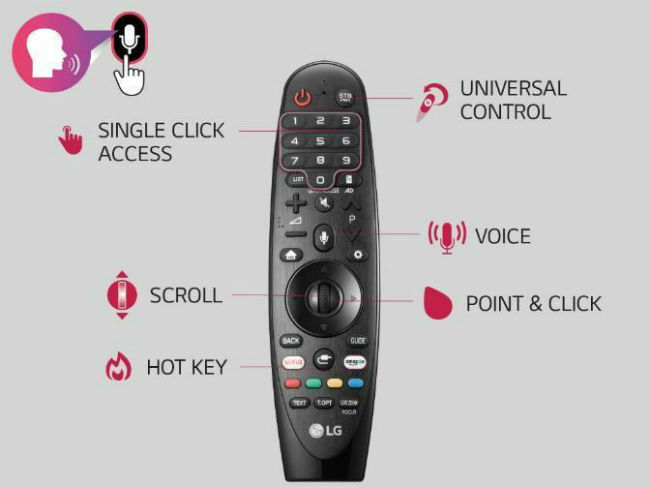 The LG OLED TV AI ThinQ comes with Magic Remote, this remote lets users simply point at different options on the screen in order to select them. Not only that, but it also comes with a built in microphone that lets users issue voice commands. Thanks to the AI assistant, users will be able to operate the TV quite easily. It also features dedicated hot keys for Netflix and Amazon Prime Video. With the LG OLED TV AI ThinQ devices, buyers also get a screen that features really slim bezels. These slim bezels ensure a more immersive experience since the bezels don’t come in the way of the visual experience. With so many features, it is no surprise that the LG OLED AI ThinQ series of TVs always already received their fair share of accolades to name few. The LG OLED AI TV C8 received the iF Design award this year, while the α9 Intelligent Processor has been chosen as CES 2018 Honoree for the same event. With so many features and accolades, it’s clear that the LG OLED AI ThinQ is one of the TVs you need to consider when purchasing a top-of-the-line TV for your entertainment needs. Click here for more information about the TV, while the video below should give you a clearer idea of what the TV has to offer. Watch this video to experience the LG OLED AI ThinQ.